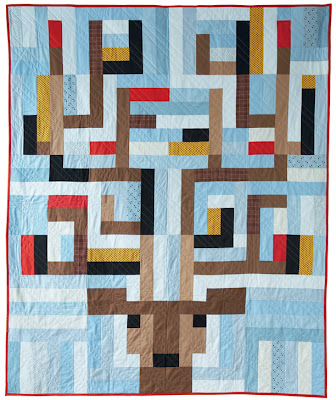 Here's a wrapup of the humorous quilts we've shown over the last week. Enjoy! Row 1, L-R: Woof meets Warhol, by Kelly Gallagher-Abbott, at Jukebox Quilts; Mad as a March Hare: I Put My 'Hare' Up to Show Off My 5 'Carrot' Necklace, by Laurie Ceesay, at Artsy Chick Quilts; Quilt in the Headlights, by Boo Davis, at Quiltsrÿche. 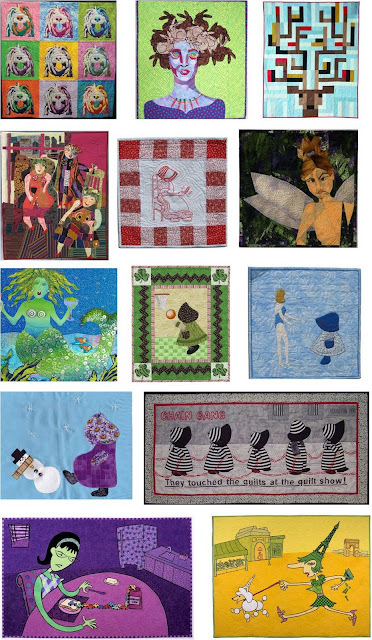 Row 2: Three women at the Hilton, by Pamela Allen, at Pamelart; Sunbonnet Sue sends text messages on her cell phone, by Bonnie MacGregor, for the Alliance for American Quilts; Don't Piss Off the Fairies, by Ruth Powers, at Ruth Powers Art Quilts. Row 3: Mermaids like Margaritas with Salt, by Ellen Edith, at Ellen Edith; March Madness, by Christine Porter and Darra Williamson, from A Year in the Life of Sunbonnet Sue by Martingale & Company; Sunbonnet Sue meets her modern counterpart, by Dorothy Day, at the Alliance for American Quilts. 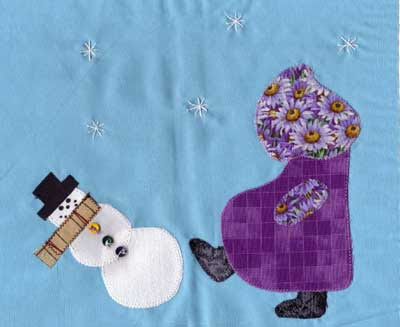 Row 4: Sue kicks the snowman, at Bad Sue Quilts; Chain Gang, by Rosalie Gray, at Quilts Kingston. Row 5: Traffic Jam, and Paris- Wish you were Hair, by Pam RuBert, at pamrubert.com. Dorothy Day says: "I can just see stocky Sunbonnet Sue when she sees a super thin model in this day and age". Dorothy used calicos for Sue’s clothing, and batik for the modern girl and the background. The quilt was made for a "New from Old" contest (see Quilt Index Record 1-6-FC). We love the combination of traditional redwork and the modern theme. Hand embroidered redwork, fabric pen, machine pieced and machine quilted. 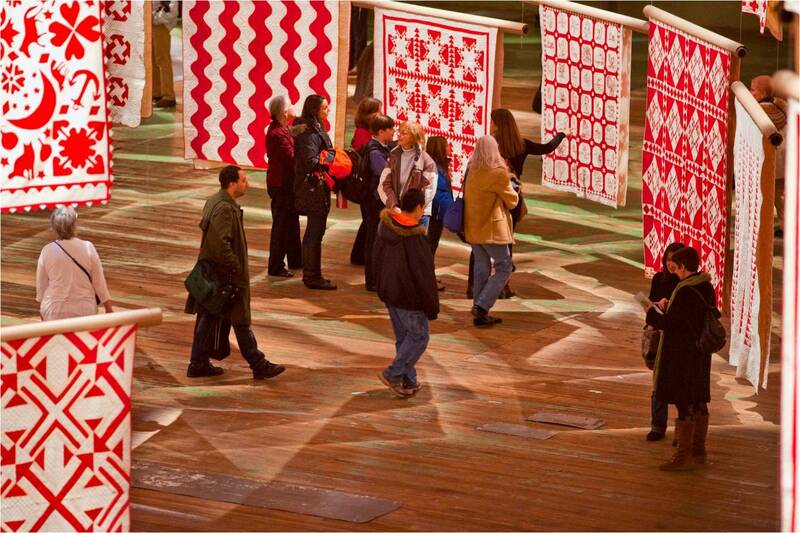 (see Quilt Index Record 1-6-14C). Does this remind you of the opening scene in O Brother, Where Art Thou? 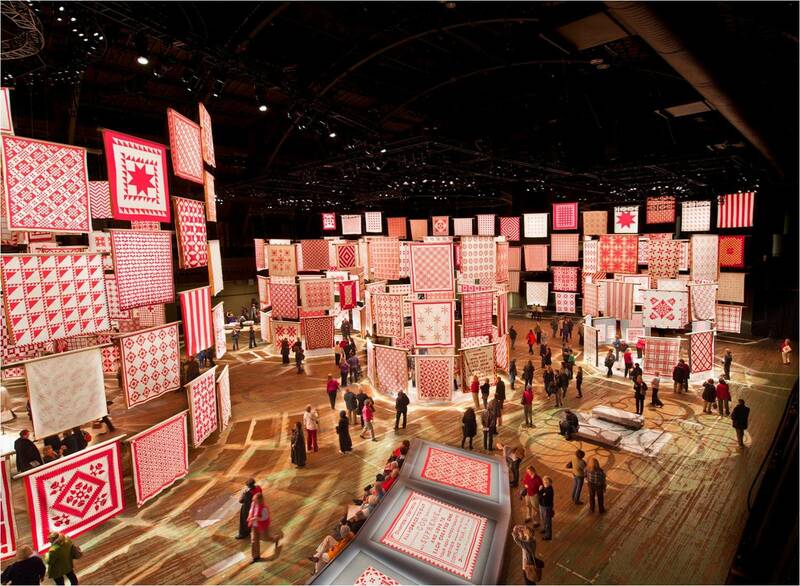 We're always afraid that this will happen at the quilt show. Not that we would touch any quilts, oh no, not us. 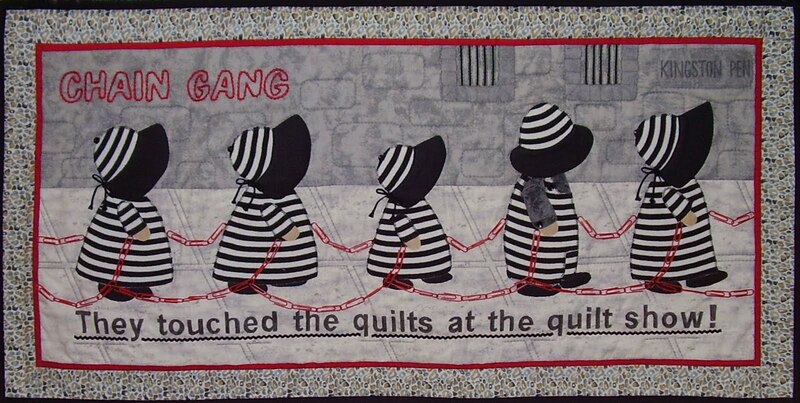 "Chain Gang" won a blue ribbon for most humorous quilt at the Quilts Kingston show. Also, don't miss the hilarious articles by Barbara Brackman: Sunbonnet Sue's Dark Side and Sunbonnet Sue Wrecks. These books have some really cute Sues. L-R: A Year in the Life of Sunbonnet Sue, by Christine Porter and Darra Williamson (mentioned above); International Sunbonnet Sue , by Debra Kimball; Sunbonnet Sue and Scottie at Play , by Suzanne Zaruba Cirillo. 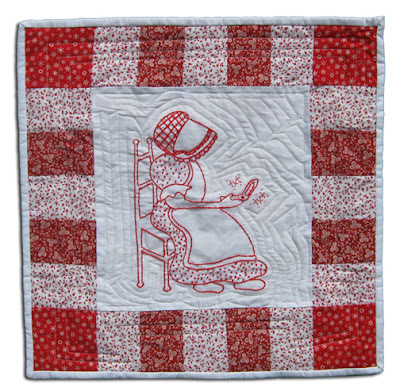 *The Sunbonnet Sue blog, the Sunbonnet Sue website, and the Home of Bad Sunbonnet Sue are the websites of Kim Bunchuck. Joke of the day. 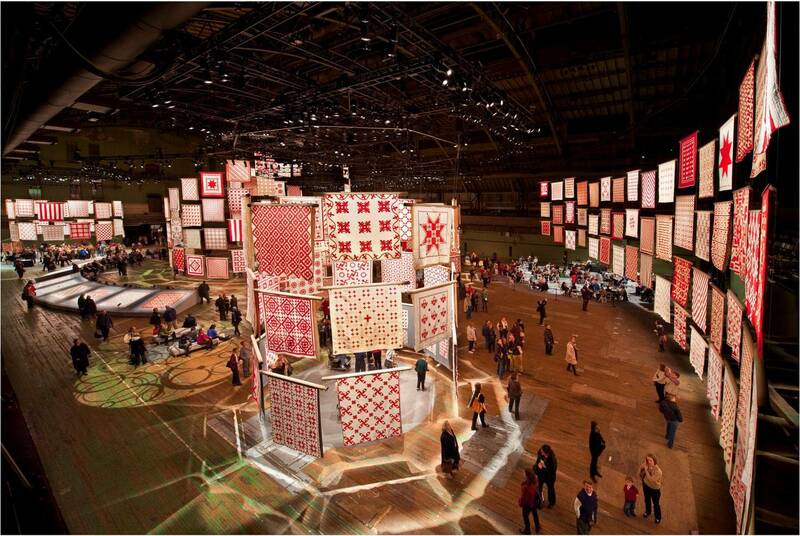 What do you get when a quilting icon takes legal action against a famous doctor? Answer: Sunbonnet Sue sues Who ? 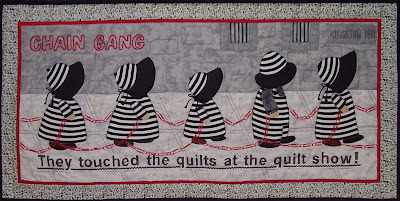 It's day 6 of our humorous quilts series, and we are having so much fun ! 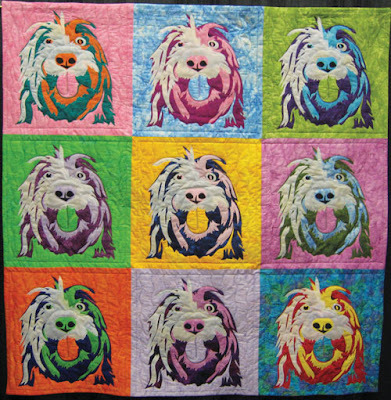 We have a chance to chuckle at some really humorous quilts from some of our favorite artists - like Pamela Allen, an award-winning artist, quilter and teacher based in Ontario, Canada. 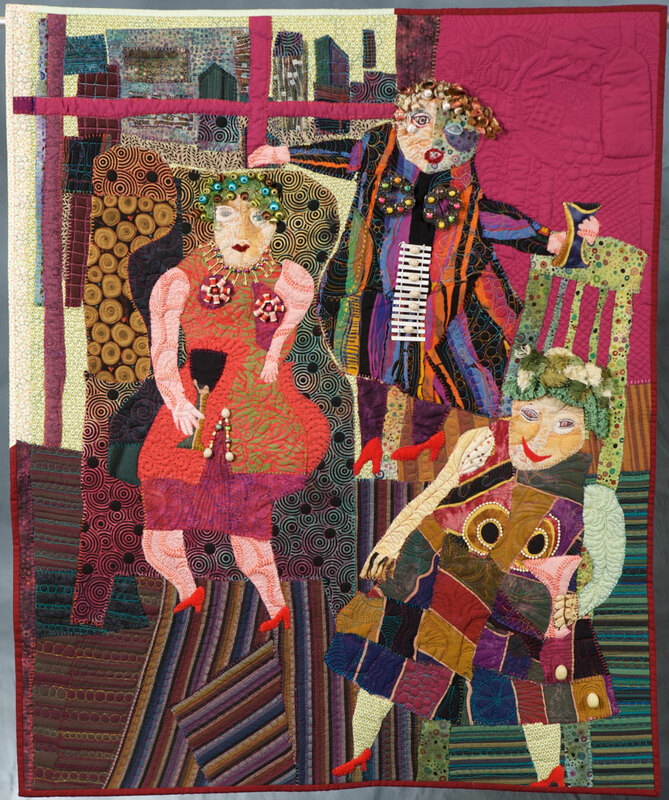 Her "Three Women at the Hilton" won Most Humorous Quilt at the Road to California, 2010. "Three Women" is a wonderful example of Pamela Allen's collage-style quilts. Here is Pamela and her two friends as they enjoy every minute of their time at the Houston Quiltfest in 2008. Take a look at the clever decorative embellishments on the (er, chest) of the lady in orange (below). 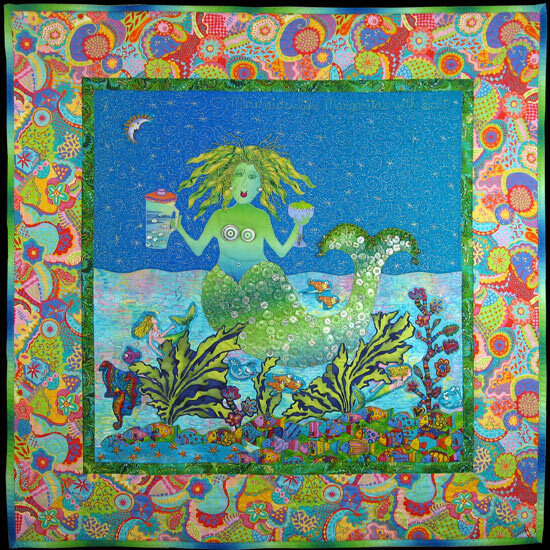 Pam RuBert is an amazing artist who makes contemporary and humorous art quilts, and also draws and explores other forms of mixed media. Her cartoon-style quilts are out of this world. 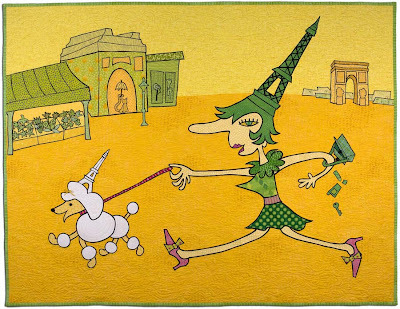 This scene from Paris is just perfect: the woman and her poodle both have mini Eiffel Towers atop their heads. This is one of a series of quilts and drawings, in which Pam RuBert morphed the idea of vintage post cards titled “Wish you Were Here” into crazy hairstyles that look like famous world landmarks. For more information see the Paris - Wish you were Hair web page; also check out St. Louis - Wish you were Hair which is showing at Fiber Art International. Click on the image to see the detail of the jam jar, and what is crawling out of it. About her humorous works, Pam RuBert says: "I’ve always believed that humor and creativity are linked — they both seem related to the ability to step outside of ourselves and look at things from a different or surprising viewpoint. 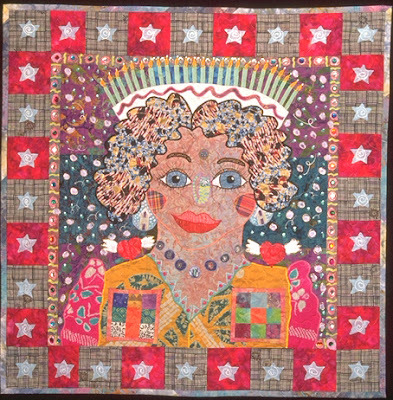 In many of my quilts there is a woman I call PaMdora — she views the world around her with a strange mixture of astonishment, dismay, and amusement." 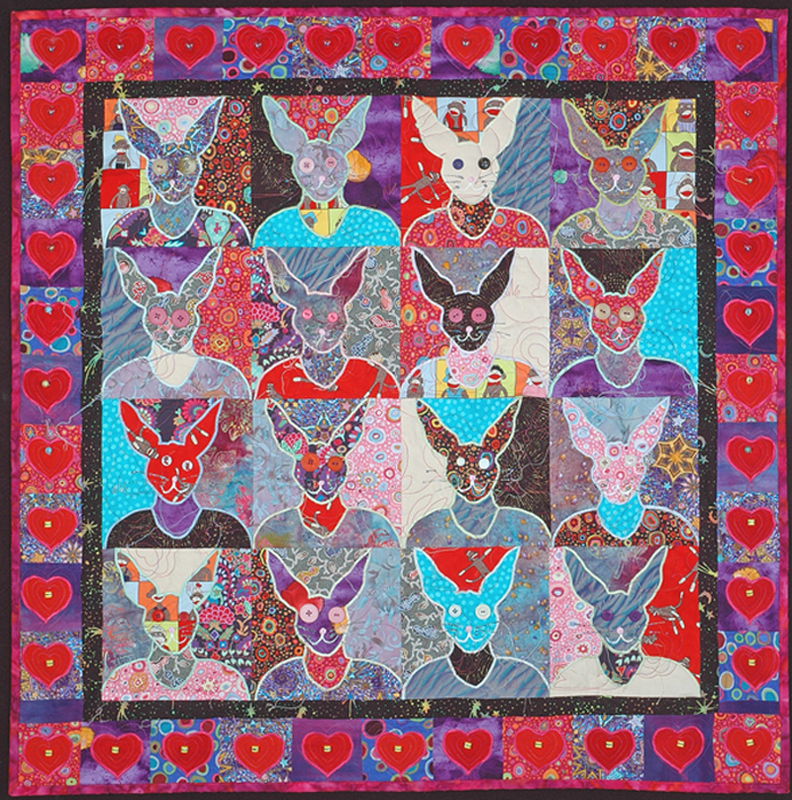 Pam RuBert's work has been exhibited at solo and group shows, and in national and international exhibits including Quilt National, FiberArt International, the International Quilt Show (Houston) and the Best of SAQA. 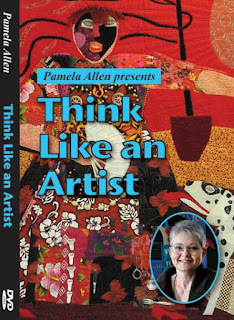 You can read about her art adventures on Pam’s art blog, PaMdora’s Box, and see a gallery of her work at Pam RuBert.com. 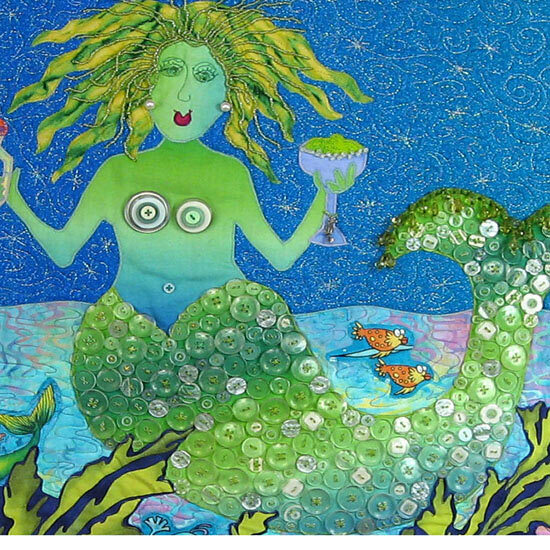 It's day 5 of our humorous quilt series, and we're here to toast the work of California artist, Ellen Edith, who is retiring after 31 wonderful years of designing fabrics and quilts. 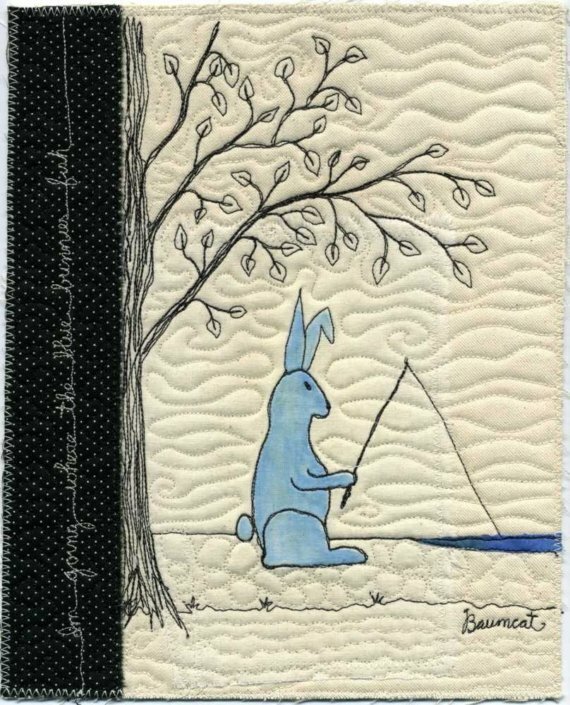 But wait: you can still be inspired by Ellen's humorous workshops and her acclaimed story quilt DVD, which features 30 of her famous quilts ! 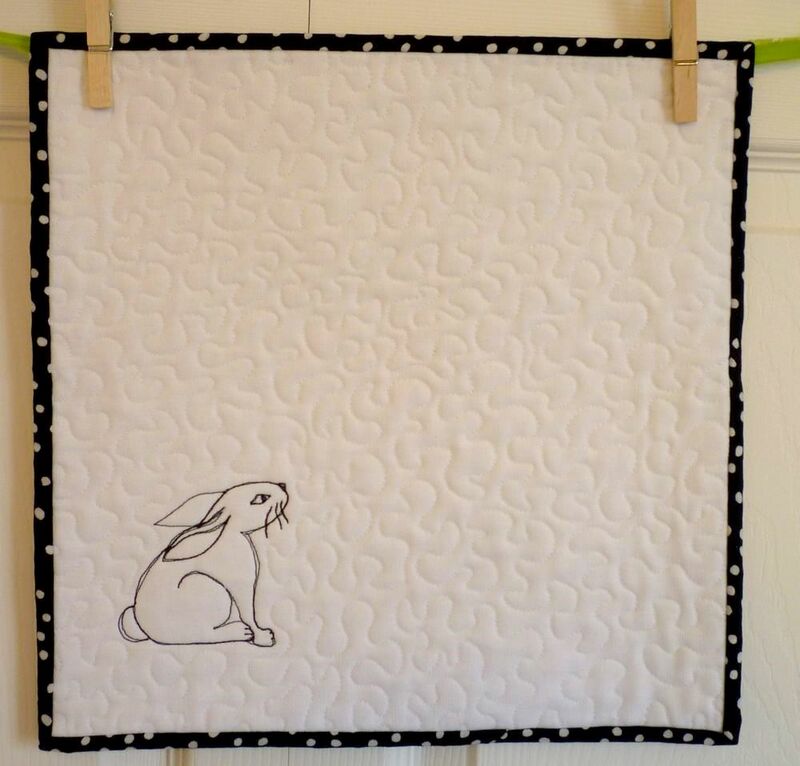 This humorous homonym quilt, which substitutes Hare for Hair, seems entirely appropriate for today. Laurie Ceesay created this fantastic piece for a Homonym Quilt Challenge. Note the five-'carrot' necklace. The carrots in the necklace were made of Scupley molding clay. The necklace was finished with orange rhinestones and some shimmer paint. Fiber artist Laurie Ceesay explains: "I was feeling like this was very Alice-in-Wonderland like, so the woman's make up was influenced by the Mad Hatter's make up. The woman took on a "mad/crazy" look so it came full circle." 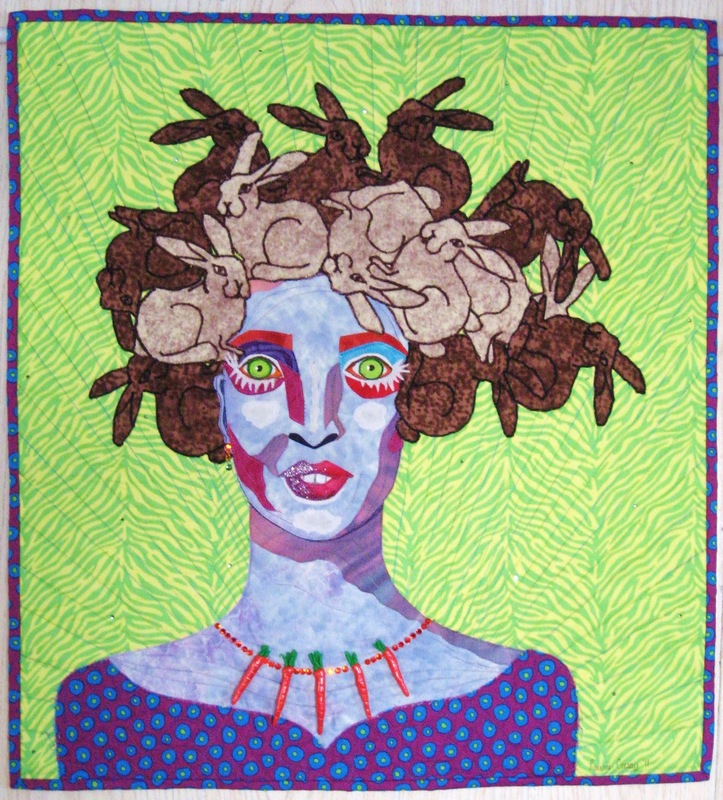 Laurie Ceesay is a contemporary quilter who specializes in portrait quilts. Her work often focuses on hairstyles, make up, replicating the human form in fiber, retro fashion/prints, flowers and fairies. She works with bright colors, batiks and large scale prints, and she embellishes her quilts with rhinestones, beads, baubles, yarn, paint and crayons. Also, Laurie is launching her own business to turn her creations into patterns that anyone can follow. 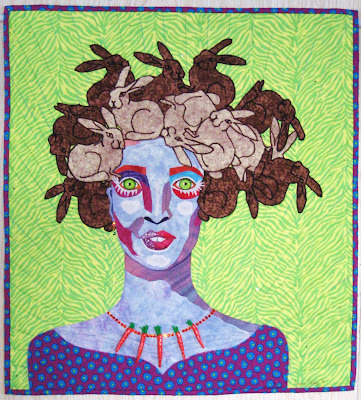 You can read all about it - and see more marvelous portraits - at her blog, Artsy Chick Quilts. Image credits: The image is shown with the generous permission of Laurie Ceesay. 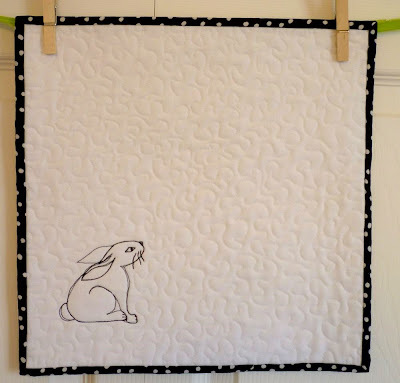 Are you interested in making a humorous quilt? We love the work of Kelly Gallagher-Abbott. She is the founder of Jukebox Quilts, and has been providing unique, fun, and whimsical patterns and products for the quilt market for the last thirteen years. Kelly is also an accomplished art quilter, as evidenced by her brilliant "Woof Meets Warhol", below. 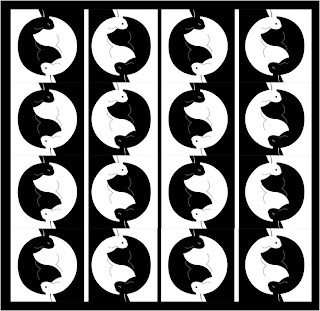 We were amazed to discover that "Woof meets Warhol" was appliqued on a longarm Gammill machine. 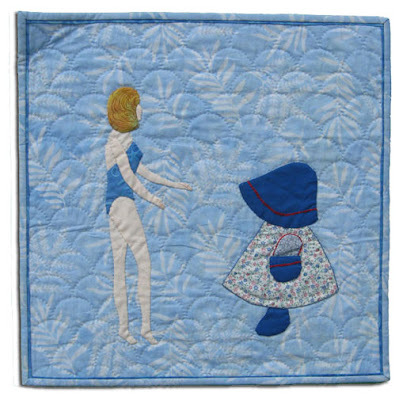 For a gallery of her one-of-a-kind works, see Kelly's art quilts. 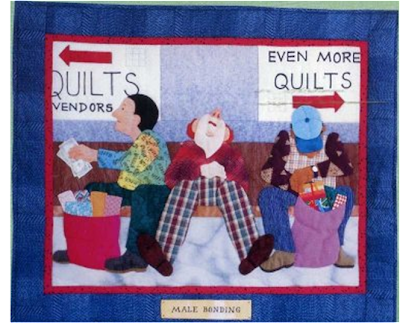 At Jukebox Quilts you can find a whole collection of humorous quilt patterns, including the famous Male Bonding, which features a familiar scene at a quilt show. For fun patterns by Kelly Gallagher-Abbott and a team of 15 designers, visit the store at Jukebox Quilts where you will find patterns for the Information Retrieval System (dog with newspaper), Empty Nest Syndrome (mom and dad kick up their heels) and Shear Bliss. Also, check out the free Jukebox patterns page ! Quilts started out as very utilitarian, practical items for warmth and comfort in daily life. However, one of the most fun aspects of our craft has been the development of quilts to express artistic and cultural themes, such as holidays, celebrations, and humor. Laughter and comedy are part of all cultures, and humorous quilts are a wonderful way of expressing our more lighthearted moments. For the next week we're bringing you one humorous quilt per day. "Don't Piss Off the Fairies" makes us laugh because the irony of this topic. We usually think of fairies as whimsical, effervescent, creatures of childlike delight. However, what happens when one of them has a bad day like all of us occasionally do? The result is a very human expression of grumpiness on a non-human being, and that brings a smile to our faces. 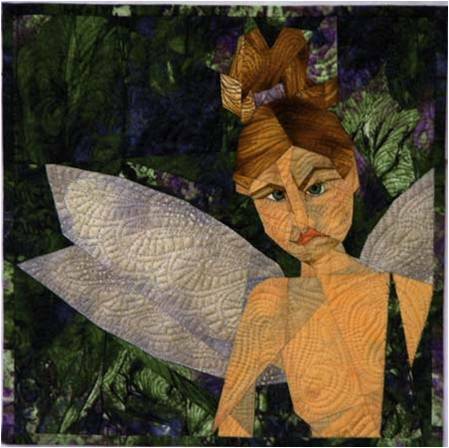 This little fairy in her woodland setting is intricately machine-pieced and machine-quilted. Notice how the light falls upon her delicate wings, which brings out the graceful quilting design. The golden skin tones complement the icy lavender shades of the fairies' wings and help to play up the focal point of her facial expression. Ruth notes that it was a bit of a challenge to find the right fabric for her skin, but she thinks the batik she used worked out perfectly. She says, " I just love searching for the right fabric", and we know that echoes the sentiments of so many quilters. "Don't Piss Off the Fairies" is a one-of-a-kind art piece that is now privately owned by the Thomas Contemporary Quilt Collection. However, if you are looking for a really cute (non-pissed-off) fairy pattern, check out Fairies In My Garden at Ruth Powers' patterns page. We really enjoy Ruth's work, as it is so inspired, fresh, and creative. You can see more quilts in progress - and more fairies - at Ruth Powers' Blog. Image credits: The image is shown with the generous permission of Ruth Powers. p.s. How does Google Translate deal with "Piss Off" ? Let us know ! In case it doesn't translate, the MacMillan dictionary has these synonyms: To annoy, provoke, anger, bother, frustrate, irritate, infuriate, antagonize. In short form we may just say P.O. as in "I'm PO'd". Undoubtedly there are similar terms in every language. We'd love to know. Red and white quilt show photos... and free stuff ! The Infinite Variety: Three Centuries of Red-and-White Quilts show, which we previewed in March, still has the quilting world buzzing. So when the American Folk Art Museum offered us some photos of the show, we jumped at the chance. Plus we learned that there is a free App for iPhone, iPad and Android owners. Quilting goes high tech ! More info on free quilting resources after these gorgeous photos by Gavin Ashworth. And did you know that there are more free Apps for iPhone-toting quilters? Check out the highly-rated QuiltingCalc by Robert Kaufman fabrics. 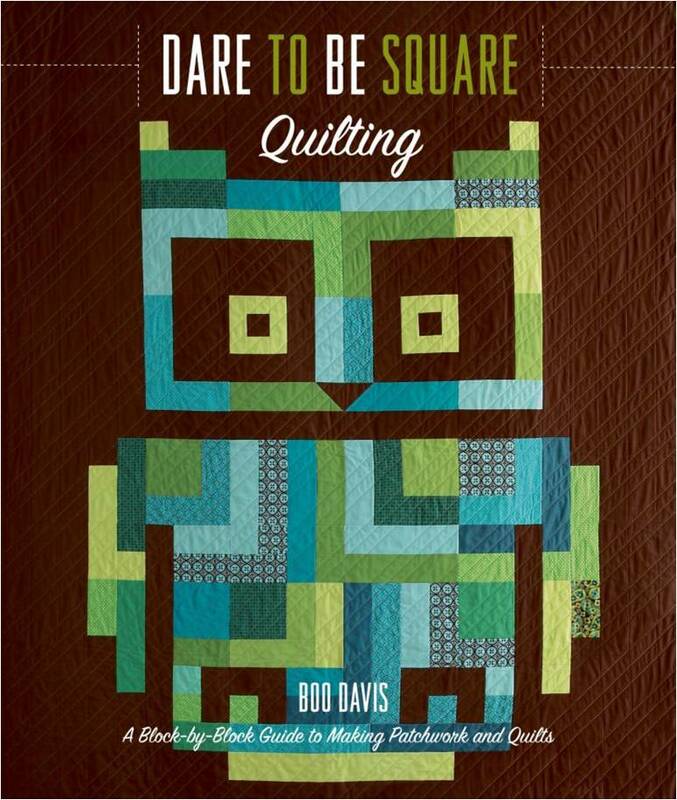 Oh, and the free quilting podcasts by Alex Anderson or by Pat Sloan. You don't even need an iPhone to listen to podcasts... you can listen online (the iTunes software is free)! Are you in need of a little Monday inspiration, as we are? Consider the work of Therese May, who makes her art in an exciting way to uplift all who view it. Therese finds inspiration everywhere she looks, but mainly from inside herself. Her work is clearly from the heart. Therese May was trained as a painter, and her quilts begin with drawings that she uses as templates for fabric appliqué shapes. She pins these to muslin and sews them with a satin stitch and hand-quilts the layers, then adds detail with beads, buttons, and other embellishments. In Birthday Quilt Goddess, the beatific Goddess is wearing a big birthday cake with candles on her head, like a crown. She has a serene smile on her face, because she is at peace. She has “Nine Patch Pockets” on her bodice; the pockets are for containing prayers for world peace. For details, see the Birthday Quilt Goddess page. 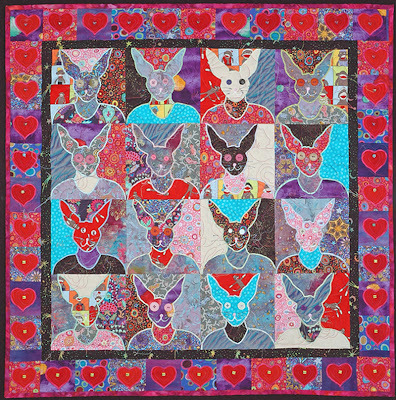 In Therese May's quilted portraits gallery you can find this wonderful bunny quilt and other “Quilted Portraits” or “Puzzle Interchange” quilts. The playful images with interchanging colors bring to mind the works of Andy Warhol. Ah, to be young and innocent again. 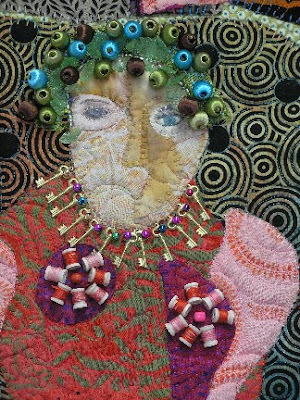 Quilted Portraits is also one of Therese May's workshops. Therese May's recent work includes this gorgeous Creative Heart quilt. 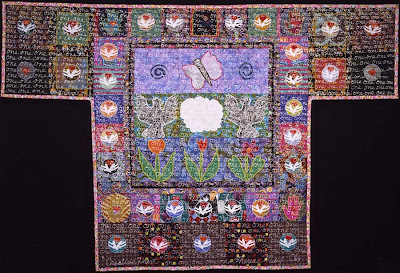 The images in this quilt are all from her heart—flowers, birds, clouds, hearts, the kimono shape. 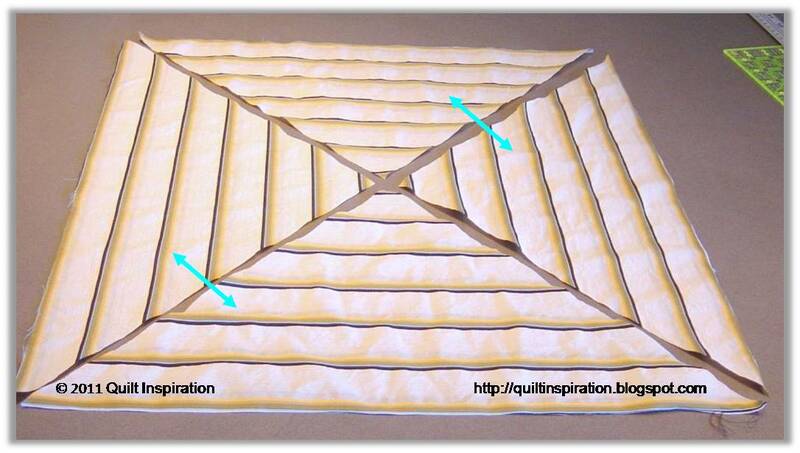 The hands of the quilting pattern sign “I Love You”. The paint writing covering the entire surface of the piece are the repetitive affirmation of “ONE” for one people, one life. The materials and techniques are fabric, thread, paint, machine appliqué, machine quilting, painted fabric, and paint writing. Image credits: Images are shown with the generous permission of Therese May. You can find more of her work at Therese May's website. For words of wisdom and affirmation, visit Therese May's blog. 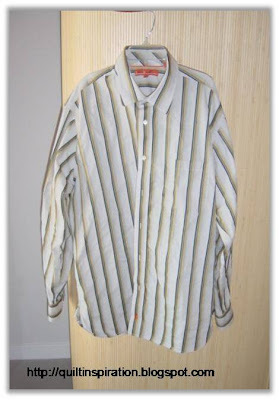 Have you ever made a craft project or quilt from a recycled shirt, and how did it turn out ? We’d love to read your comments below. We’ve been fascinated with reclaimed clothing projects ever since our post called waste not, want not: quilts from reclaimed clothing. 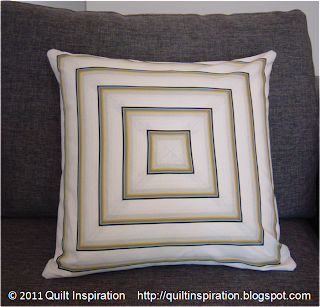 Recently we made an 18" pillow using quarter-square triangles from a man’s shirt, and we liked the way the mitered boxes looked... here’s the tutorial. Step 1. Select a man’s dress shirt, 100% cotton, size XL or larger for an 18” pillow (directions for a 16" pillow are given below). 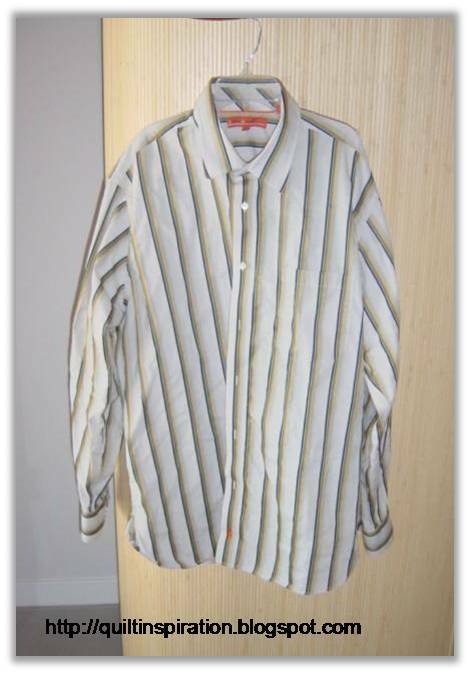 The nearly-new Italian shirt shown below was made of fine Egyptian cotton and it cost $3 at the thrift shop. Wash before cutting. Keep the button placket intact on the front of the shirt; do not cut it off. Cut off the cuffs and collar. Cut away the sleeves and set them aside for the project. Then cut along the side seam allowances to separate the front and back of the shirt. Cut off the shoulder pieces. 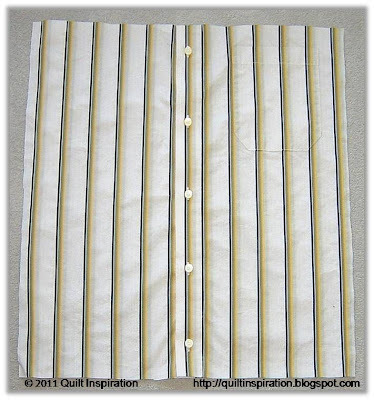 Photo A upper left: We will cut a 19” square out of the front of the shirt, centering the square on the button placket. This will become the back of the pillow. Photo B upper right: We will cut two 20” (w) x 10” (h) triangles out of the back of the shirt. Photos C and D lower left and right: We will cut a 20” x 10” triangle out of each sleeve. 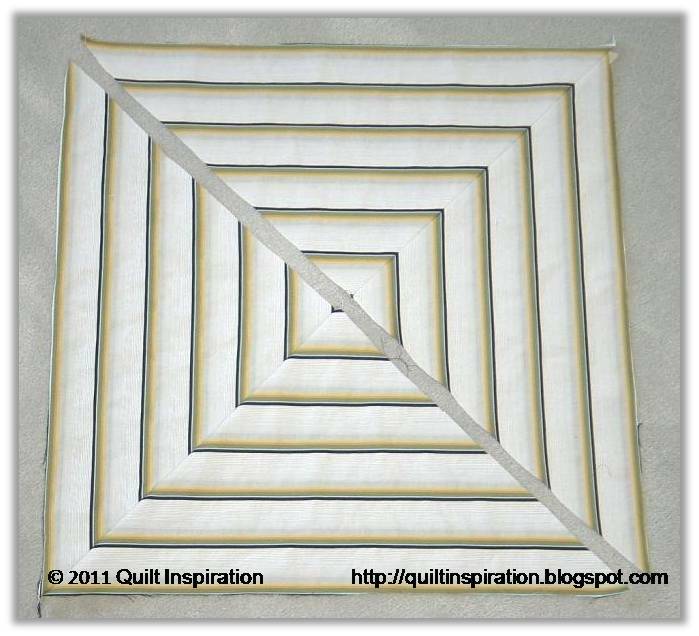 Mark out a 20” square on a large piece of plain newsprint or craft paper. This includes a ½” seam allowance. Draw an “X” from corner to corner, then cut into four triangles as shown above. Step 4. 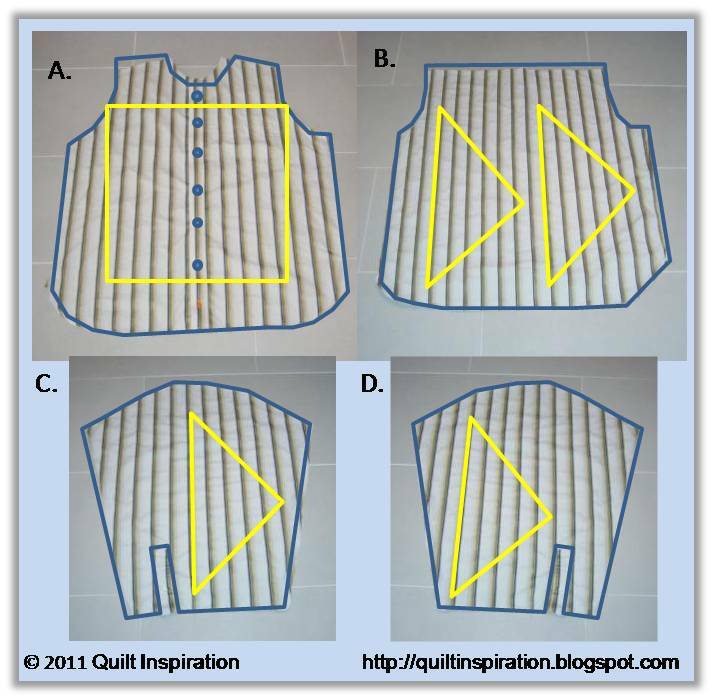 Lay out the triangles on the shirt back and sleeves. Decide where to place the quarter-square triangles relative to the stripe pattern, making sure to use the same alignment for all 4 triangles. This shirt has stripes that are asymmetrical, which means that all triangles must be oriented the same way. As shown above, we lined up the base of each triangle with the black stripe. 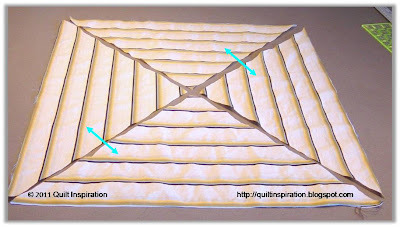 We chose this orientation so that the center of the pillow, and the edges of the pillow, would not fall right on top of a stripe. 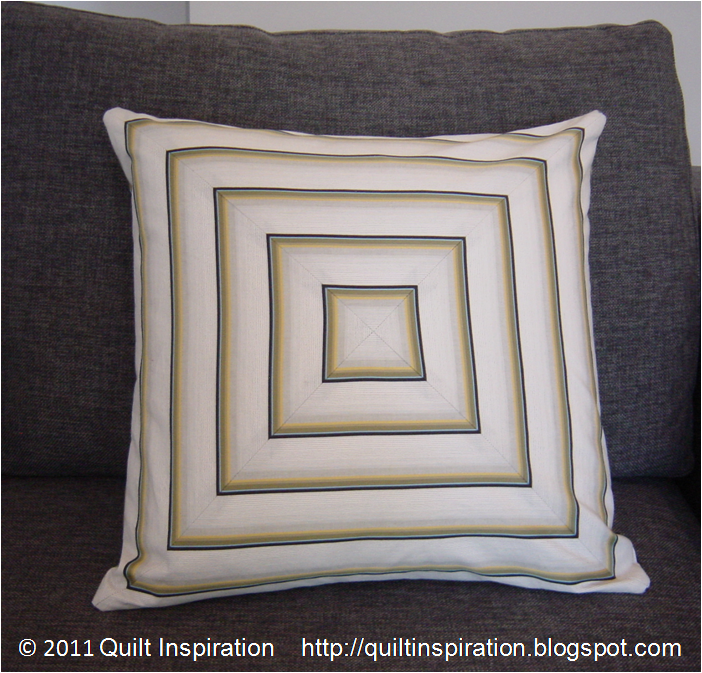 (See the first photo of the finished pillow… the center of the pillow looks like an open box). 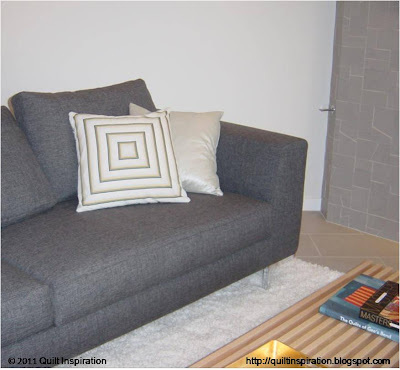 Your decision as to where to place the triangles will depend on the stripes you have to work with. 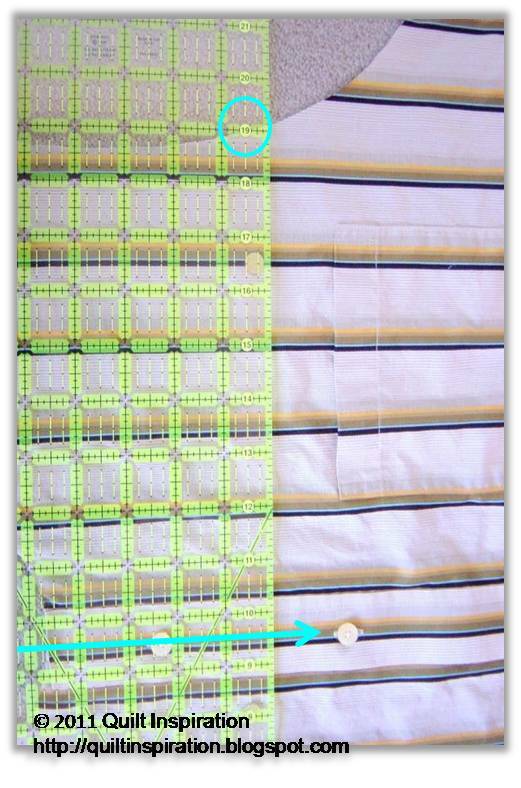 Use scotch tape to attach the pattern to the shirt. It is sticky enough but easily removed. 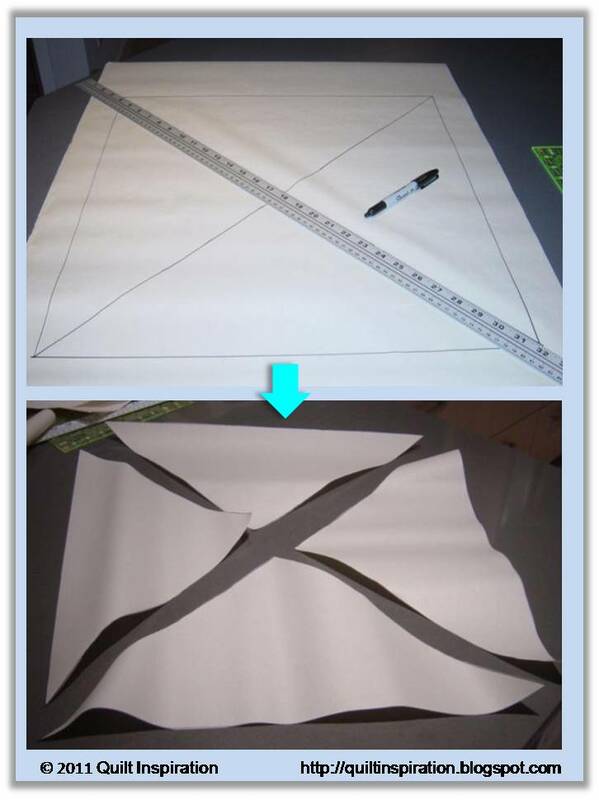 Cut out the triangles from the shirt back and sleeves using a ruler and a rotary cutter, then remove the pattern pieces and tape, being careful not to stretch the bias edges of the triangles. Step 5. 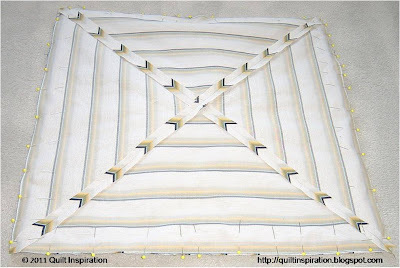 Sew the quarter-square triangles together. 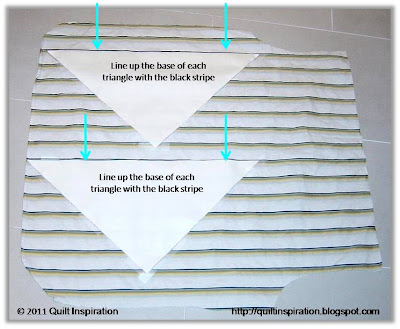 Sew two pairs of triangles together along the bias edges, right sides together, matching the stripes, using a ½” seam allowance. Make sure the stripes match as you are pinning, by sticking a pin through the top piece – the pin should come out at the same place on the bottom piece. Press the seams open. Now you have two half-square triangles as shown below. Step 6. Sew the half-square triangles together. 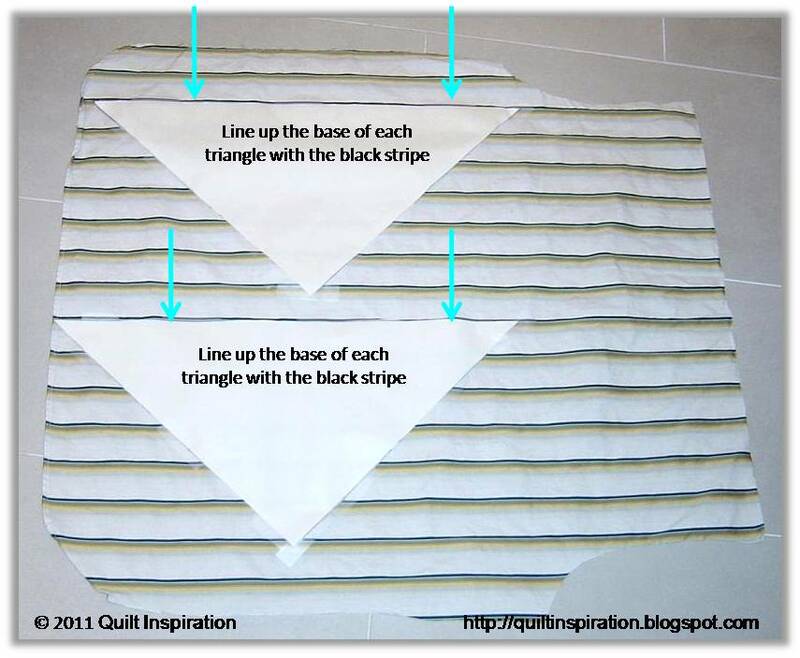 Now sew the two half-square triangles together, right sides together, matching the center seam and the stripes. This will be the pillow front. Step 7. Prepare the back of the pillow. 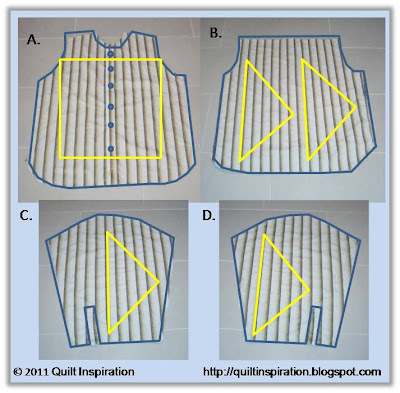 Prepare the back of the pillow using the shirt front; the button placket will become the button closure on the pillow. You will need a square that is 19" x 19". Decide whether or not to keep the shirt pocket. We like it because it reminds us that the pillow came from a shirt! If you prefer, you can remove the pocket with a seam ripper, or you can mark and cut right through the pocket. Consult the next diagram before marking and cutting. Use a water-soluble pen to mark out the square as shown above: Center the 9.5” mark on the ruler over the buttonholes. Mark the shirt at 0” and 19” on the ruler; note the 19” mark just meets the armhole on this shirt and it is about 1-1/4” above the pocket. If the shirt is smaller you will have to move the ruler further down. To make sure all of the cuts will be square, use the stripes on the shirt as a guide to line up the marks on the ruler. Cut the 19” square with fabric scissors instead of a rotary cutter, since you will be cutting through the thick button placket. It will cut easily with a good pair of scissors. This is the 19” square that was cut from the front of the shirt. 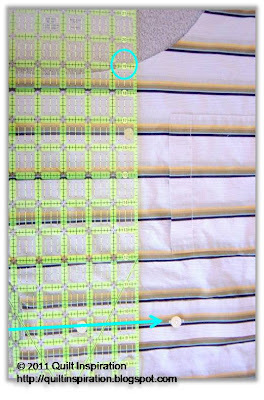 Notice the placement of the 5 buttons on the placket – the buttons are not too close to the top and bottom edges, since you do not want to have to sew over a button ! After you have cut this piece, unbutton the middle 3 buttons so there will be room to insert the pillow form once the front and back of the pillow cover are assembled. Step 8. 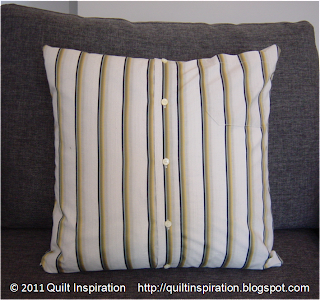 Sew the front and back of the pillow together. Pin the front of the cover to the back, right sides together. There are no stripes to match. Sew a ½” seam all the way around. 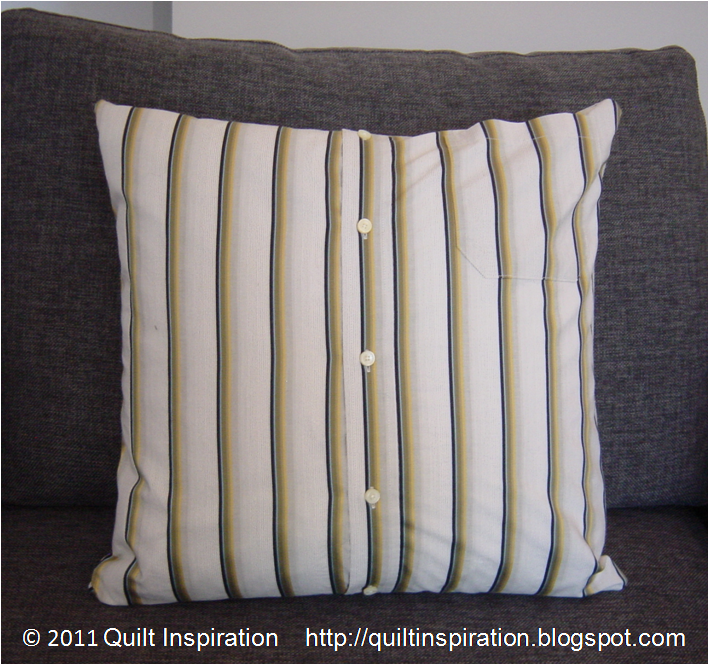 You can sew using one stripe as a guide, so that the stripe pattern will match on the left and right sides of the pillow. 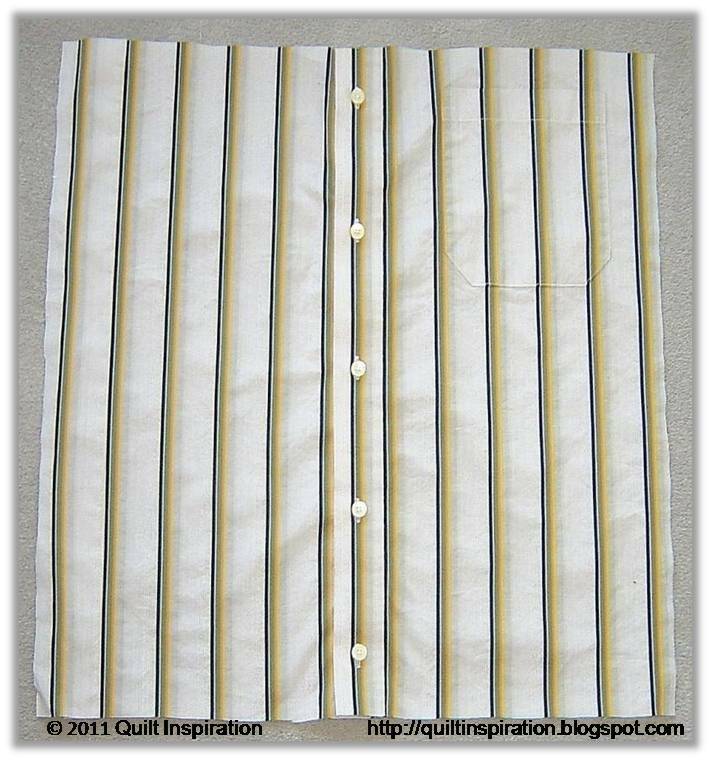 After sewing, turn the pillow cover right side out through the button placket on the back side and insert an 18” pillow form. et voila… one nifty pillow. You can even hide a remote control in the shirt pocket on the back ! For a 16” pillow, cut a 17” square from the front of the shirt and an 18” square template for the quarter-square triangles. Symmetrical stripe patterns are easier to work with. The triangles can be laid out facing each other on the back of the shirt. 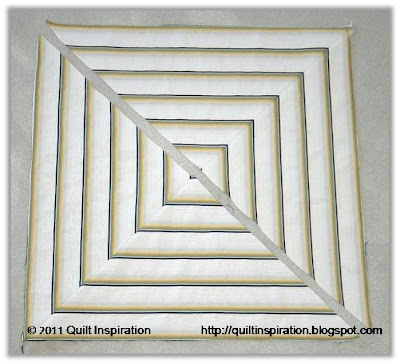 You can make the mitered squares any size you want, and mix and match them in a quilt. If two different colors are used for the triangles, they can be arranged to make hourglass blocks. We'd love to hear your questions or comments ! 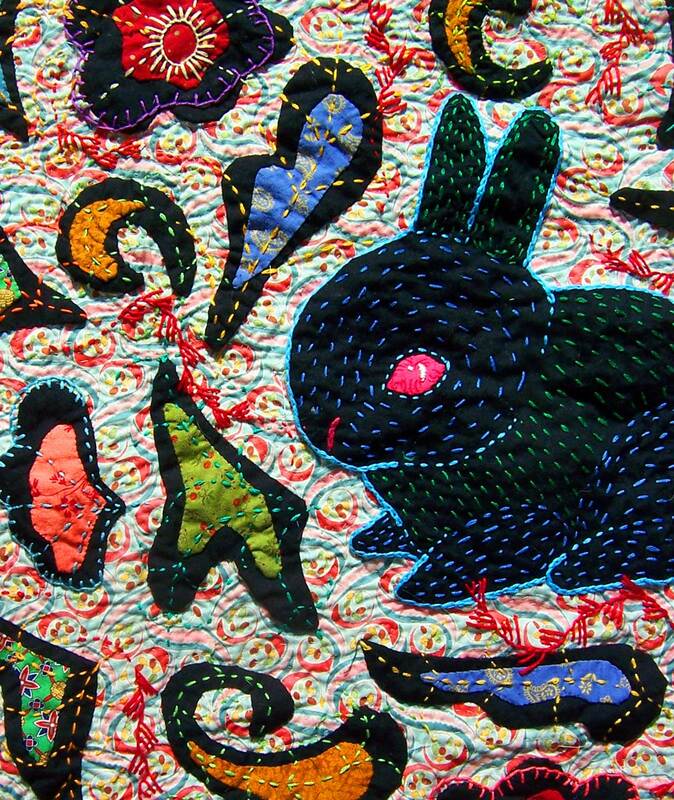 Here's a little bunny created by Andrea Zuill, a painter, designer, and quilter based in Southern California. Andrea works in many different media, and her embroidery designs often have a whimsical, innocent "naif" style to them, which is associated with folk art. 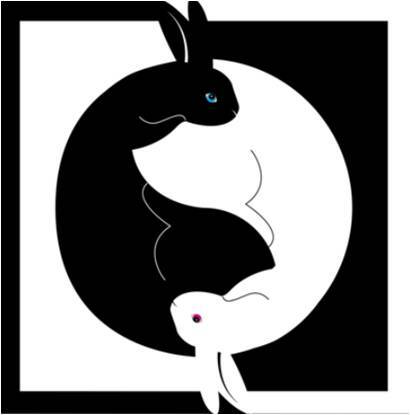 We think that the black bunny is adorable, because he seems very young, and he seems to occupy a timeless, enchanted world, surrounded by flowers, leaves, and other decorations that complement his rounded shape. 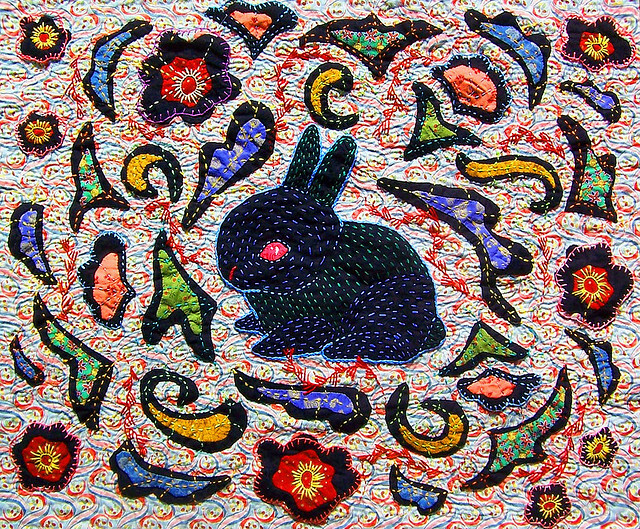 To emphasize his shape and to make sure that he doesn't blend into the background, Andrea has used electric blue thread to hand-quilt the bunny in an "echo" pattern which further defines his shape. Click on the image below to see the detail, and you will be able to see the outline stitching around the bunny and the blanket stitching around some of the flowers. For the post explaining the construction of this project, please see: black rabbit quilt is finished at Badbird's (Andrea Zuill's blog). Her artwork has been described as sometimes dark, sometimes humorous, and generally figurative in nature. 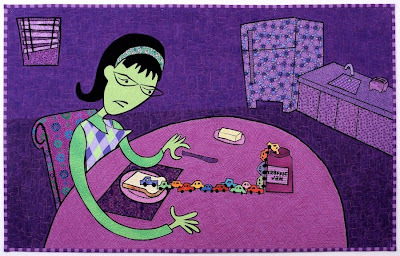 She also writes a very humorous blog: for her funny descriptions of 9 different kinds of quilters, see the post called Line that Divide. She explains: "Folk Art Quilters are very close to Art Quilters. 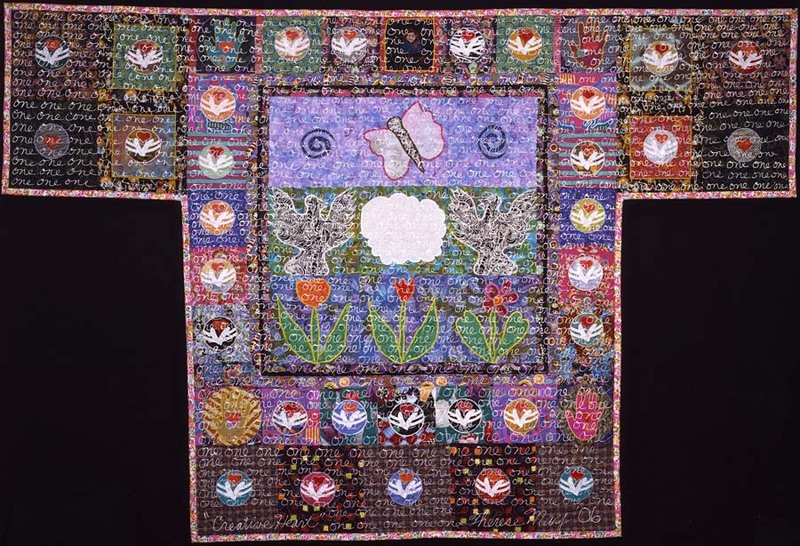 What makes a Folk Art Quilter is simplistic expressive designs and the inability to make even stitches. Flaws are acceptable, they’re Folk Artists for goodness sakes." 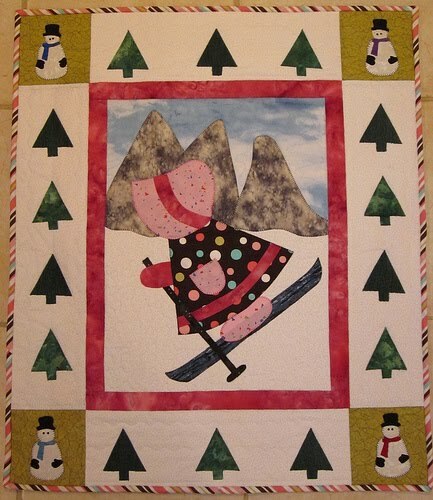 Andrea also creates beautiful quilts with light-hearted, upbeat designs. Each month, she offers a free embroidery pattern (in April's embroidery pattern, you can find a fierce little hummingbird). 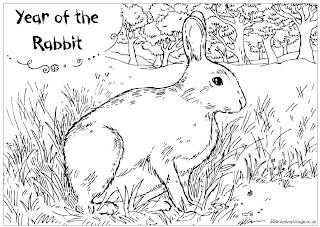 For a wonderful "Rabbit Queen" pattern, click here. Andrea Zuill has a fascinating shop on Etsy where you can find her artwork and unusual embroidery patterns; see Badbird's Art and Embroidery Patterns . 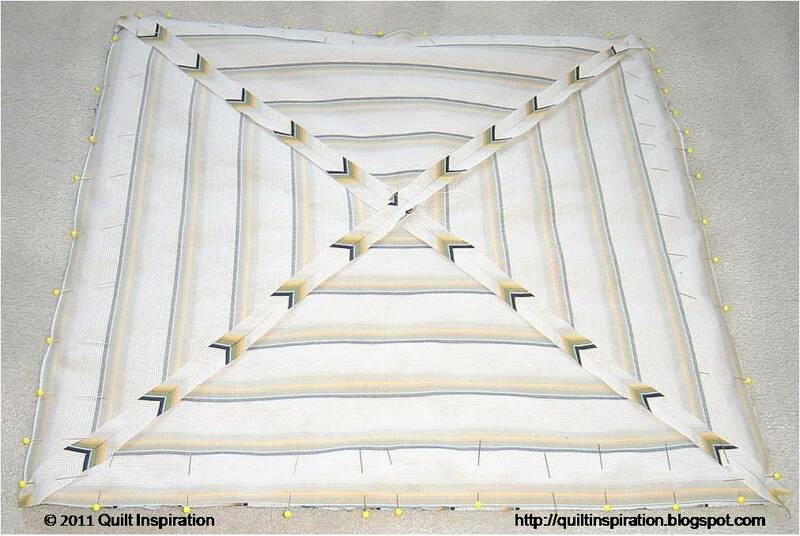 Cathy Baumgartner created this mini-quilt with free-motion quilting. 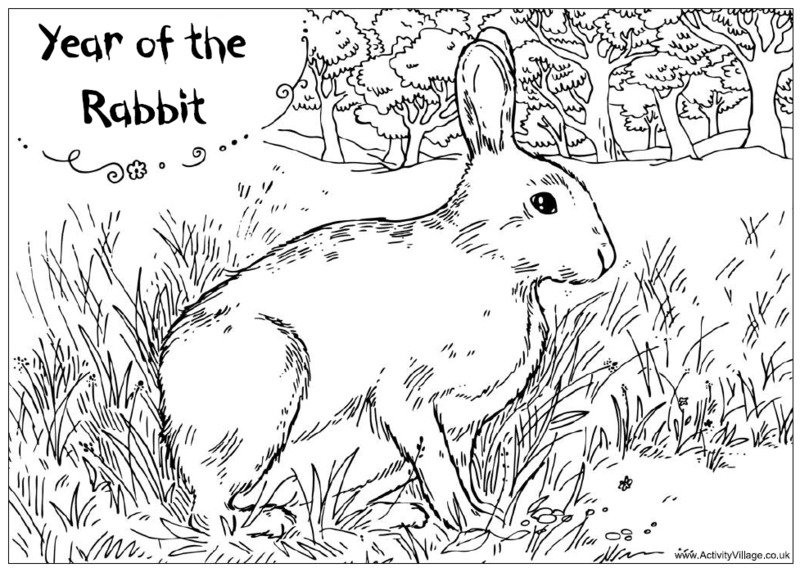 We love the simplicity of the contemplative bunny. Cathy's masterful thread sketches, including her mermaid, horse, wildlife, and bee, remind us of line drawings with a pen: the stitching is so precise, you can hardly tell it is thread ! This entire piece is only 8" x 10" (imagine machine-quilting those tiny letters!) Click to see the detail. To see Cathy's latest rabbit quilt, visit her Baumcat blog. 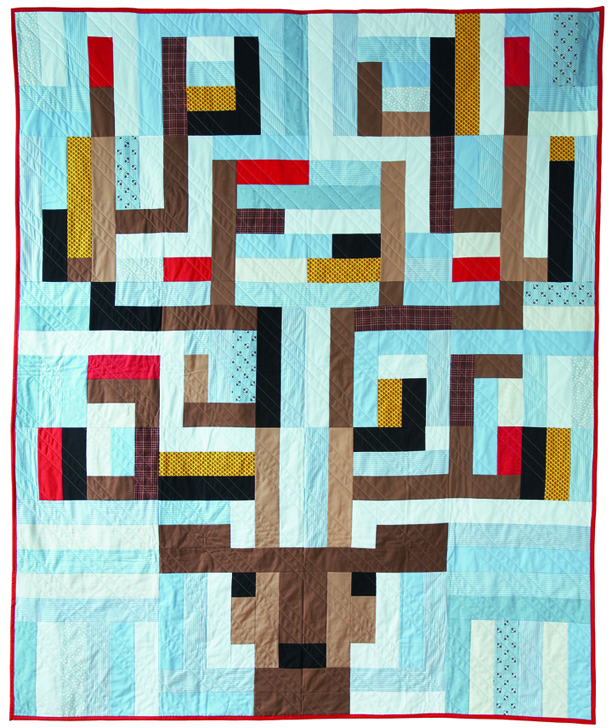 Finally, don't miss her gorgeous Prayer-Flag Quilt; each "flag" is stitched with a line from a beautiful Celtic prayer. 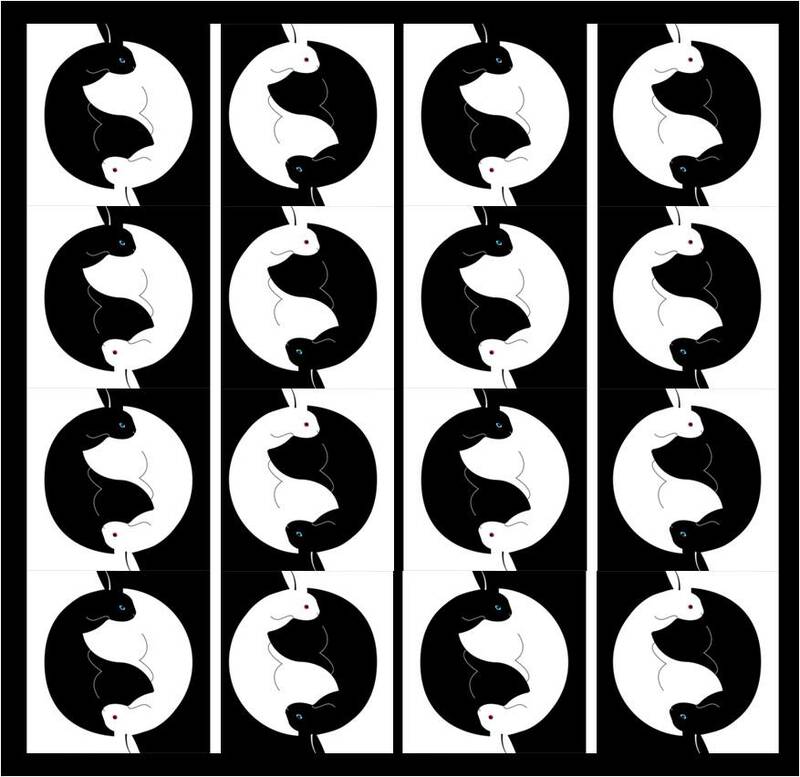 Row 1: Hand-screen-printed rabbits on white linen, 39 cm x 39 cm, by Swedish designer Maja Bäckström on Etsy. 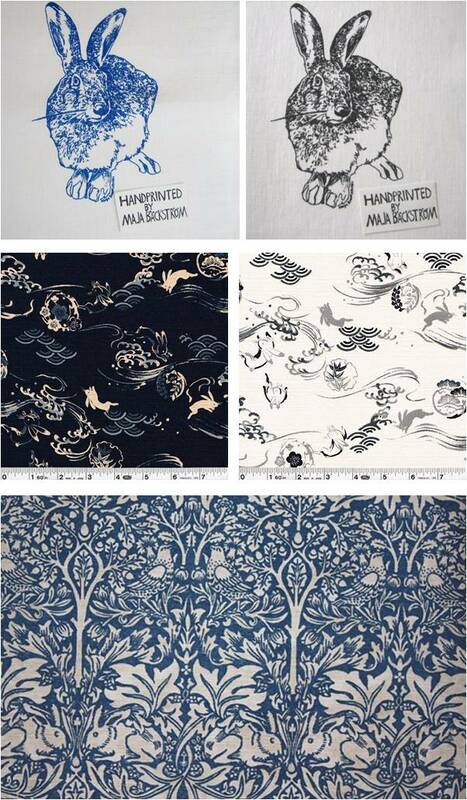 Row 2: White Rabbit of Inaba (Japanese watercolor fabric), 100% cotton, as seen at Superbuzzy. Row 3: Brother rabbit (Brer rabbit) linen fabric, a William Morris design, at Fabrics and Papers; other colorways can be found at Historic Style. 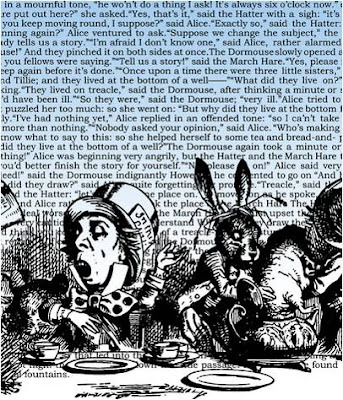 Alice's Adventures in Wonderland by Lewis Carroll is such a classic book ! This clever border fabric brings back the vintage 1800's Tenniel illustrations, along with the text, on a blue ombre background. The border prints and toile-style patterns come in coordinating colors. The quilting-weight fabric is available in fat quarters and yards at Spoonflower, where you can also see Olga Nikich's sumptuous red queen fabric. For more of her bold, graphic designs, visit Olga's website at www.olganikich.com.